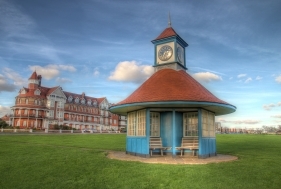 A small and highly regarded seaside town which was mainly developed around the late 1890’s and early 20th century with many fine Late Victorian and Edwardian properties. The greensward between the Esplanade and the beach was put in place in in order to protect the town under the sea defence act in 1903 and today this is still an important part of the Frinton landscape. During the early 20th century the town attracted many visitors from High Society and Connaught Avenue was named after the Duke of Connaught. It is the principal road in the town and has for many year been dubbed East Anglia’s - Bond Street. Even today the town still has a high reputation for conservation and there is not any amusement arcades in sight. Indeed it is only in the past 20 years that a fish and chip shop and a public house was allowed to be opened. There is however still a wide array of shops, café’s and restaurants along Connaught Avenue. Other attractions to the town in addition to it’s sandy beach are the Golf club with 18 & 9 hole courses. A cricket club and a renowned Tennis club which hosts an annual high profile tournament attracting many top players and celebrities. There is also a small theatre.